Waterfront Concerts, SAVE (Suicide Awareness Voices of Education) and Music Matters are excited to announce the Second Annual IMPACT MUSIC FESTIVAL featuring some of the biggest names in rock coming together in support of suicide prevention and mental health awareness for two days on SATURDAY, JULY 27, featuring FIVE FINGER DEATH PUNCH, IN THIS MOMENT, SKILLET, CLUTCH, BETWEEN THE BURIED AND ME, and more and on SUNDAY, JULY 28, featuring GODSMACK, EVANESCENCE, KILLSWITCH ENGAGE, ALL THAT REMAINS, BEARTOOTH, ANDREW W.K. and many, many more! 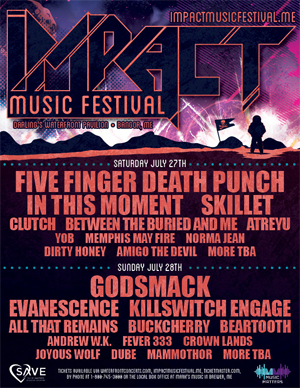 The 2019 Impact Music Festival #ImpactMF2019 will be held the weekend of JULY 27 + 28, 2019 in BANGOR, ME at the DARLING'S WATERFRONT PAVILION. In 2018, Music Matters (MM) the charitable organization associated with Impact Music Festival raised $25,000 in proceeds from the 2018 Impact Music Festival which was then donated among the following recipients: SAVE, Health Equity Alliance, Acadia Hospital, and Maine Military & Community Network. The team at Waterfront Concerts, SAVE and Music Matters continue to be passionate about making an IMPACT within the community and beyond. They remain. committed to raising awareness about the suffering that results from mental health issues and suicide among our fans, friends, and family. Proceeds from the 2019 Impact Music Festival will again be donated to organizations and individuals who continue to dedicate their time to educating and supporting people and families that are struggling with mental health issues. You're not alone. Confidential help is available for free. This year, Impact Music Festival will be offering "Tiered Pricing" for a limited time for those looking to save some money and make plans early with TWO-DAY ticket prices starting at just $59.00. That's a little over $2 per band. 2-Day Festival Tickets, VIP Packages and Hotel Packages will are on sale now. For all diehard #ImpactMF fans, the festival will once again be offering hotel and metal camp packages for the festival weekend. We’re bringing back the payment plans this year! The payment plans allow the purchaser the flexibility of breaking up the total payment for their tickets. Payment plans will only be available for select ticket prices. Tickets available via waterfrontconcerts.com, charge-by-phone at 1-800-745-3000, or purchase locally at Mark's Music in Brewer.